Certain qualities—such as cleanliness and security—are baseline healthcare standards and patient expectations, so hospitals must look to ancillary services and features to create a point of differentiation that positively influences patient scores. With this in mind, and considering the increasingly longer wait times in hospitals and treatment centers, survey data in the hospital sector is now reflecting the inherent benefits in creating a more relaxing waiting room experience. One trend in this area is the growth of the use of relaxation-inducing imagery in digital signage systems and installations. Research backs up the benefits of the calming effects of scenic nature images in urban indoor environments. This concept is a foundation of biophilia, a modern design field that focuses on the calming effects of scenic nature images integrated into urban environments. Biophilia is based around the proven fact that humans possess an innate tendency to seek connections with nature, resulting in a natural state of relaxation when this experience is fulfilled. 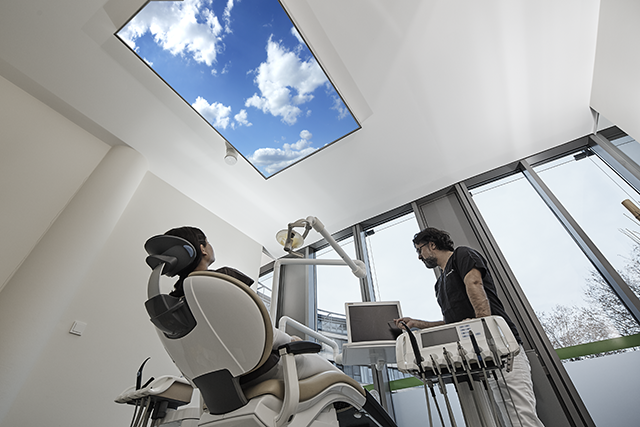 Further, research has found that when realistic scenic nature images are integrated into urban indoor settings, such as a hospital, lower stress levels can be observed and measured. In 1984, Dr. Roger Ulrich, a highly-respected figure associated with the field of biophilia, studied the effects of a simulated nature environment (as in images, videos, etc.) in a hospital setting. A key goal of the landmark study was to discover if simulated nature—print and video imagery—had the same calming effect as actual nature itself. Research has found that when realistic scenic nature images are integrated into urban indoor settings—such as a hospital—lower stress levels can be observed and measured. For the study, a hospital room was designed with a high-resolution mural of plants and animals in a colorful landscape that incorporated high-resolution images of plants and organic nature. Pre- and post-test patient-stress measurements (blood pressure, heart rate, breathing rate, etc.) showed significant reductions in stress, hostility, and aggressive behavior among patients in this simulated environment. While the integration of digital signage in hospitals has been happening for years, installing digital signage systems dedicated to showcasing biophilic content for the purpose of inducing calmness is relatively new. Researchers have found that patients’ stress levels are lowered in a biophilia-centric environment. This was confirmed by a Cornell University research study that monitored the stress levels of patients in different waiting room environments, including one in which TV news was running continuously. The Cornell study found that most patients widely disliked the news programming, and felt more stressed as the waiting time increased. In environments that included loops of branded edutainment for services performed by the doctor or hospital, respondents were also unenthusiastic. The study found that the display of infomercials during waiting can lead to information and sensory overload, contributing to a heightened feeling of stress and anxiety. Biophilic content, by contrast, did not produce unintended negative consequences. As a matter of fact, the researchers found the patient’s stress levels lowered in the biophilia-centric environment. The trend in employing biophilia-centric digital signage systems becoming adopted industry-wide in hospitals of all sizes is on the rise, but this trend is particularly noticeable with respect to smaller independent hospitals—those who are seeking a competitive edge over bigger name-brand hospitals. It is the influence of the increasing role patient scores and rankings play on patient selection of a hospital that is leading this trend. Founded in 2001, Oakleaf Surgical Center in Eau Claire, WI is an example of an independent hospital focused on seeking a competitive edge through patient satisfaction rankings. In 2009, Oakleaf was voted the number one hospital in the U.S. out of 4,500 hospitals surveyed in terms of patient satisfaction. And since then, Oakleaf has remained in the top one or two percent in terms of patient satisfaction in the Eau Claire area and consistently appears in the top 10 or 15 nationally with regards to patient satisfaction scores. Oakleaf competes for patients in the Eau Claire area with the Mayo Clinic national network of hospitals. The hospital had installed several types edutainment-based digital signage systems in the past, but removed them because of patient complaints regarding distractions and increased worries the content created. After installing a biophilia-centric 4K 8-bit UHD integrated digital signage system in the hospital, patient scores began reflecting the significant relaxation benefits the scenic nature content was fostering. The proof was found in the comments on the patient surveys mentioning the sense of relaxation that the scenic nature content induced in pre- and post-op situations. A biophilic-centric digital signage system installed in the hospital environment solves a design challenge that hospital administrators face—knowing that nature has a calming effect on patient care, which can lead to higher satisfaction scores—but needing to clear the hurdle of how to integrate live plant and nature life into the indoor urban environment. 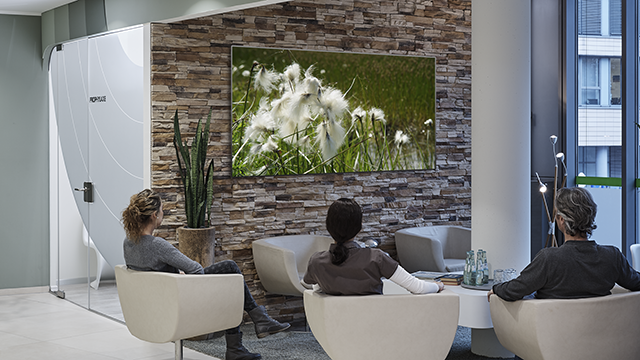 A 4K UHD digital signage display system addresses this challenge by displaying vivid true-to-life images that, after research and study, have been proven to have the same calming effects in patients as actual nature. An added plus for systems integrators is the additional recurring revenue which can come from this content that is licensed to be played in hospital environments 24/7. As healthcare operations—such as medical/dental offices and hospitals—seek to attract new patients in an increasingly competitive environment, hospitals need to look beyond baseline patient expectations centered on cleanliness and security. With this in mind, the documented trend in the integration of biophilia into healthcare environments is well supported. The use of high-resolution digital signage systems that loop relaxation-inducing video content in waiting rooms now gives AV integrators and hospital administrators alike a natural path to increased patient satisfaction, recurring revenue, and continued market growth.